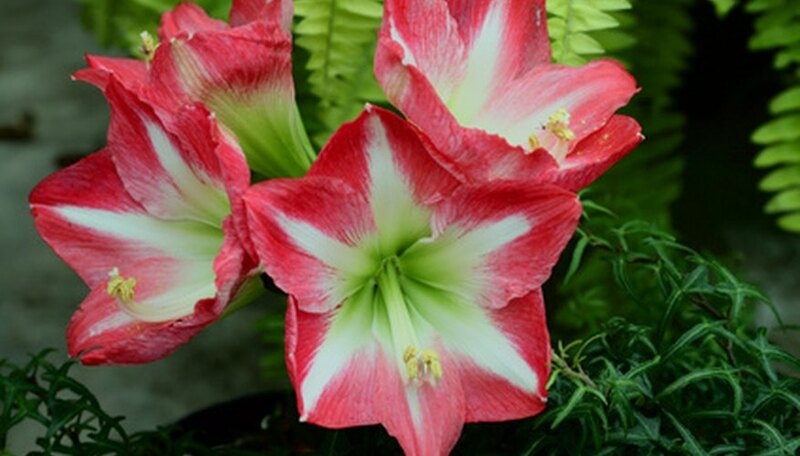 Amaryllis are flowering plants with strap-like leaves that produce large, stunning flowers. There are many varieties available that produce different colors and types of blooms. Some flower varieties have a single row of petals, and others have double or even triple rows of petals. All varieties can be used as cut flowers with a vase life of seven to 10 days. Cut the flowers slightly below the soil surface when the buds are showing color. If you need the flowers to open faster than usual, you can use techniques to force open the blooms. Add warm water at a temperature of 100 degrees F to a vase that is large enough to hold the stem of the amaryllis flower. Treat the warm water with professional floral preservative. The amount of floral preservative used depends on the amount of water in the container, the size of the vase, the brand of floral preservative and whether it is in powdered or liquid form. Read the label and directions on the floral preservative container or packet to find out how much to add. Fill an 8-oz. container with warm water and floral preservative. Read the directions on the label of the floral preservative to find out the appropriate amount to use. Cut the amaryllis stem just below the soil line with a sharp knife. Immediately place the cut end of the flower in a container of water that is room temperature. The container should be large and deep enough to hold enough water to cover the bottom of the amaryllis flower stem and the actual amaryllis flower. Move the container holding the amaryllis flower to the area where the vase and smaller container of warm water are located. Remove the amaryllis flower from the container, hold it upside down with one hand and fill the hollow stem with the warm water treated with floral preservative from the 8-oz.ounce container. Let the excess warm water overflow from the stem onto the underside of the flower for a few seconds to warm the flower. Cover the open end of the warm water-filled stem with your thumb. Place the stem end in the vase of warm water treated with floral preservative, keeping the cut end covered with your thumb until the cut end is below the water level so the warm water cannot leak out of the hollow stem. Place the vase in a bright location (not in direct sun) where the temperature is between 70 and 85 degrees F. The bloom should begin to open in two to three hours and will be almost fully open within 24 hours. Do not use water over 100 degrees F or you risk damaging the flower stem.